Faron McCain of Sweetwater went fishing at O.H. Ivie Reservoir April 14 intending to catch a big largemouth bass on her spawning bed, and he did just that. What he did not expect was to catch the same fish that was last year's new lake record, when it was caught by Jerry Bales of Hico and became Toyota ShareLunker 503. "I didn't know she even weighed 13 pounds and would qualify for the Toyota ShareLunker program, but she was a big fish, and I put her in the livewell and immediately took her to be weighed," McCain said. The person who catches the season's largest entry will be named Angler of the Year and will receive a prize package from G. Loomis valued at $818. The package includes a G. Loomis NRX854C jig and worm rod, a Shimano ChronarchD1007 casting reel and 150 yards of moss green Power Pro super-braid fishing line. 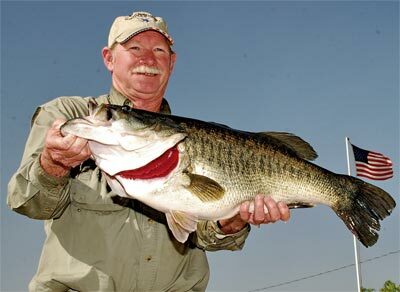 If a Texas angler catches the largest entry of the season, that person also receives a lifetime fishing license. For complete information and rules of the ShareLunker program, tips on caring for big bass, a list of official Toyota ShareLunker weigh and holding stations and a recap of last year's season, see www.tpwd.state.tx.us/sharelunker. The site also includes a searchable database of all fish entered into the program along with pictures where available.